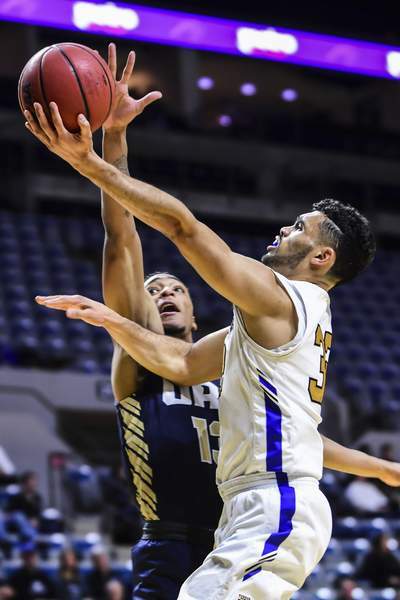 Mike Moore | The Journal Gazette Purdue Fort Wayne guard Dee Montgomery scores over Oral Roberts guard Carlos Jurgens in the first half Thursday night at Memorial Coliseum. 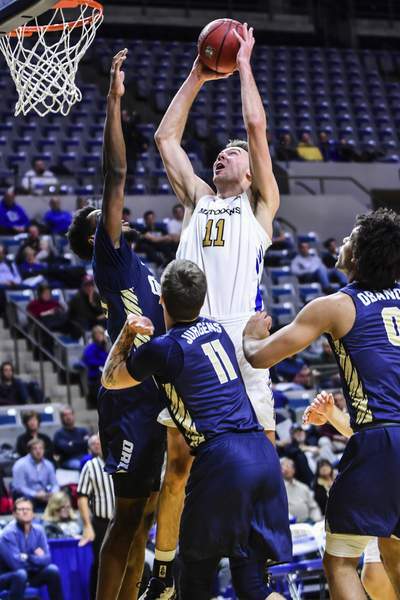 The Purdue Fort Wayne men's basketball team might have it figured out. 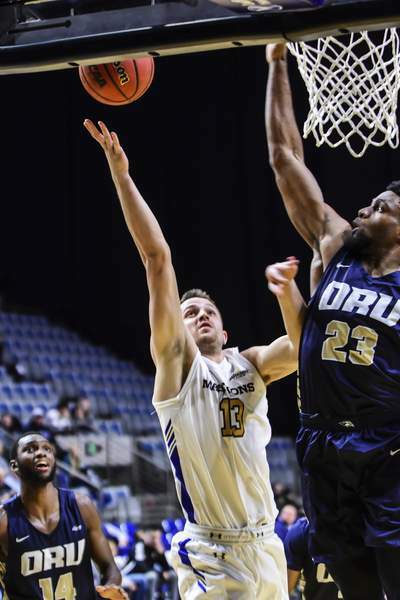 After dropping two of their first three games in December, the Mastodons (12-7, 4-0 Summit League) have rattled off six straight victories to sit alone atop the standings. PFW's 94-69 throttling Thursday night of Oral Roberts, the only other undefeated team in league play, at the Coliseum cemented their place as the team to beat. 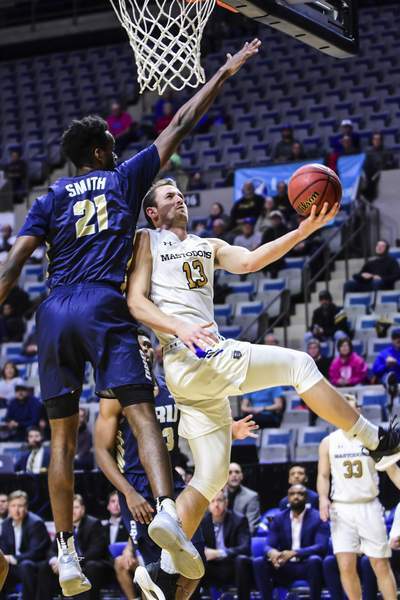 Coach Jon Coffman chalks up the success over the last month, with the last loss coming in a 95-68 rout by Austin Peay on Dec. 15, to a lineup change. 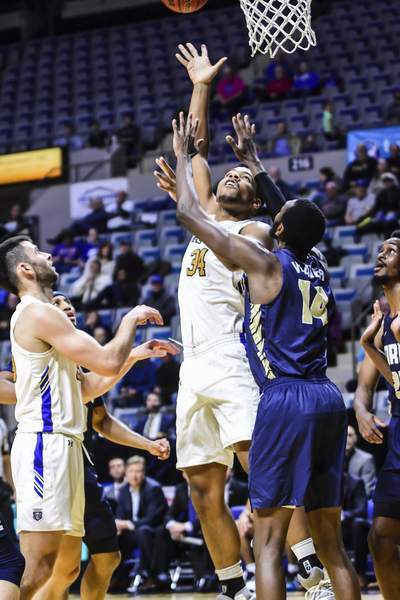 When junior guard Dee Montgomery entered the starting lineup against IUPUI – first game of the winning streak – the pieces fell into place for the Mastodons. “We're playing with an extra guard that we haven't played with in the past, so our rotations have been really good,” Coffman said. 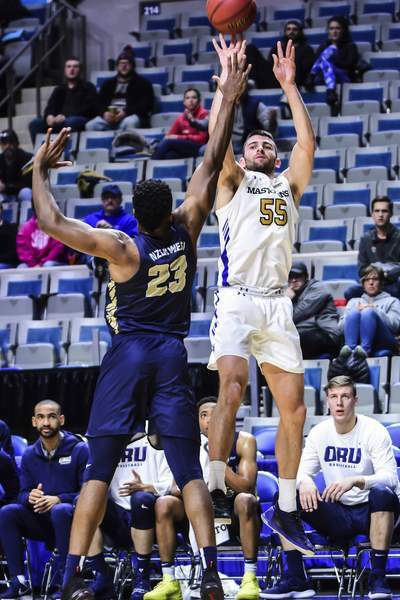 They needed to be good against Oral Roberts big man Emmanuel Nzekwesi, who torched the Mastodons in the first half for 18 points and 11 rebounds but added only one basket in the second half. PFW swarmed the Golden Eagles, snagging 15 steals and forcing 18 turnovers, which it converted into 24 points. 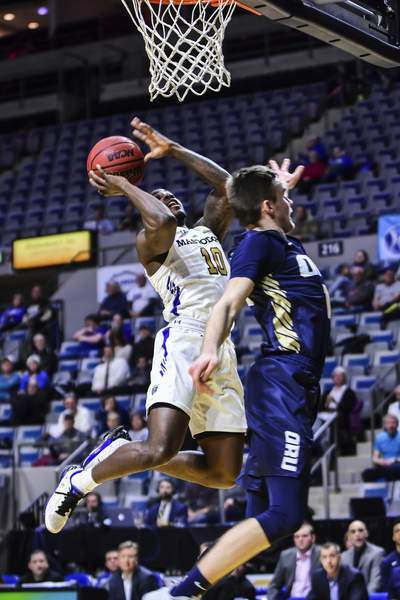 A back-and-forth first 10 minutes of the game was quickly commanded by the Mastodons, who scored on six consecutive possessions during a 13-0 run to go up by 18 points with under two minutes to play in the first half. John Konchar made a steal and a half-court collision resulted in a four-on-five PFW advantage. Harrell missed a layup, but Konchar came flying in for a vicious put-back slam to start the big run. The Mastodons hit 5 of 7 from behind the 3-point line to start the second half and finished 15 of 30. 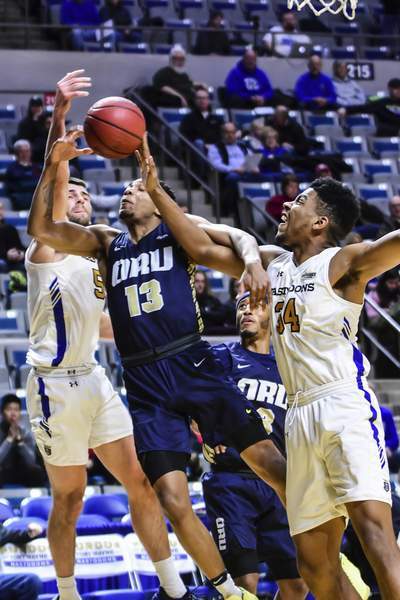 PFW picked apart the zone of Oral Roberts (7-12, 3-1), a defense the Mastodons have seen little of this season. PFW's inside-out game produced 22 assists on 34 baskets. Five Mastodons scored in double figures with Harrell leading the way with 22 points and Konchar adding 21. The Mastodons hit the road again when they play at South Dakota at 2 p.m. Sunday.